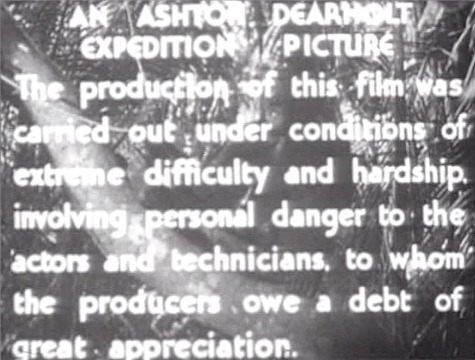 The chapter-by-chapter synopsis of the serial originally appearing here, was taken from the pressbook issued when the serial was released in 1935. 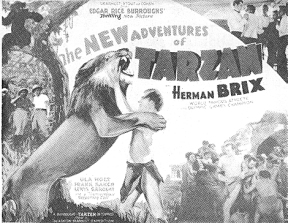 It has been reprinted verbatim in several print publications featuring the serial - as far back as the mid-60s in one of the volumes of Alan Barbour's "The Serials" to just this year (2001), as an appendix to Mike Chapman's authorized biography of Herman Brix, "Please Don't Call Me Tarzan". In between, it has been boiled down to a few paragraphs' summaries in everything from Gabe Essoe's "Tarzan Of The Movies" to David Fury's highly praised effort, "Kings Of The Jungle." Unfortunately, this synopsis is almost completely wrong vis-a-vis the actual finished serial. Only the first chapter seems to really match up, and even there there are notable discrepancies. It appears that the serial underwent a near-complete rewrite from the treatment which was used to compose the pressbook synopsis, for reasons unknown and possibly unknowable, before it became a final shooting script. By the end of the second chapter, the differences between pressbook and film become so great, that the only reason to really even keep the pressbook synopsis on hand is as a way to determine which published "experts" have actually seen the serial, and which have just read the synopsis in pressbook or reprint form. 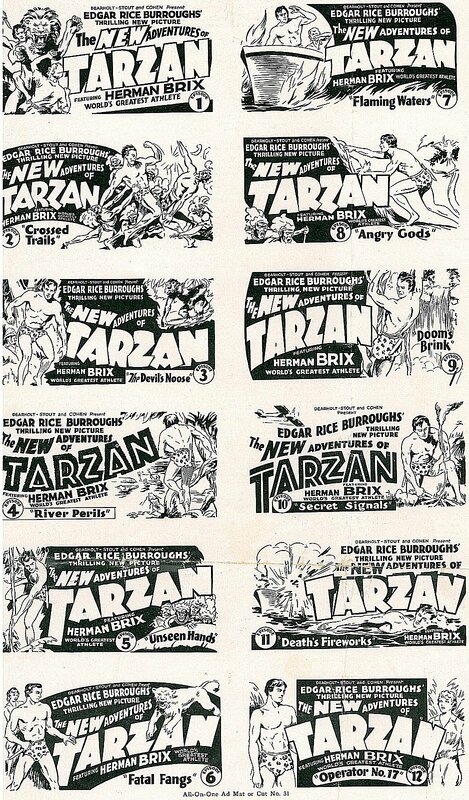 Therefore, below, we are presenting the original pressbook material alongside lobby cards, and a summary of each actual serial chapter immediately below. The serial-based synopsis, it should be noted, is not intended to be a complete, shot-for-shot workup, but also a summary of the material as it might have appeared if the real film had been used as the source of the pressbook summary instead of the abandoned screen treatment. Where possible, we've even borrowed the wording of the pressbook to stress the (few) common points. Also, despite the revised storyline, the serial was still printed with the chapter titles unchanged. Finally, the synopsis for Chapter 1 is based on the entire original 65 minute cut of this chapter, not the 44 minute version edited for reissue and most commonly used for video prints today. 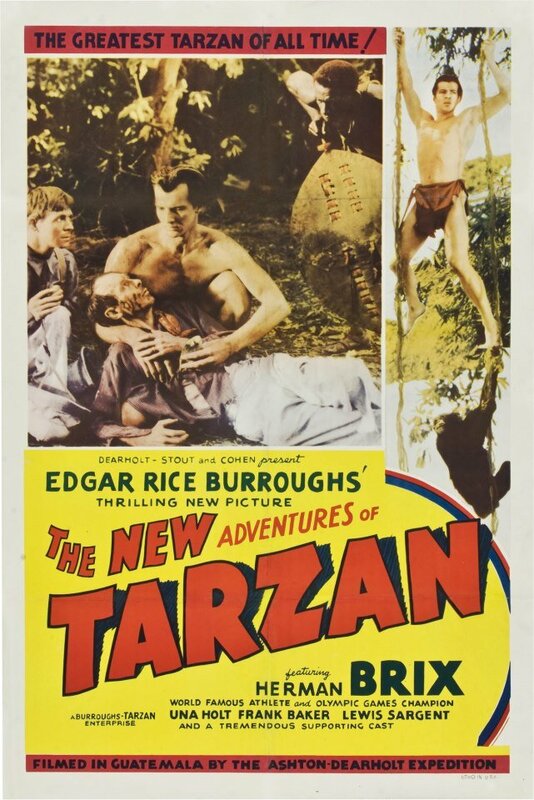 In the African jungles, Tarzan kills a lion and saves the life of a demented Frenchman, who tells him that D'Arnot, Tarzan's best friend is lost in the wilds of Guatemala. Rushing to D'Arnot's aid aboard the S.S. Wangai, Tarzan accidentally meets MAJOR MARLING, an archaelogolist leading an expedition to the Guatemalan jungles in the hope of locating the famous GREEN GODDESS - a priceless Mayan relic containing a fortune in gems. 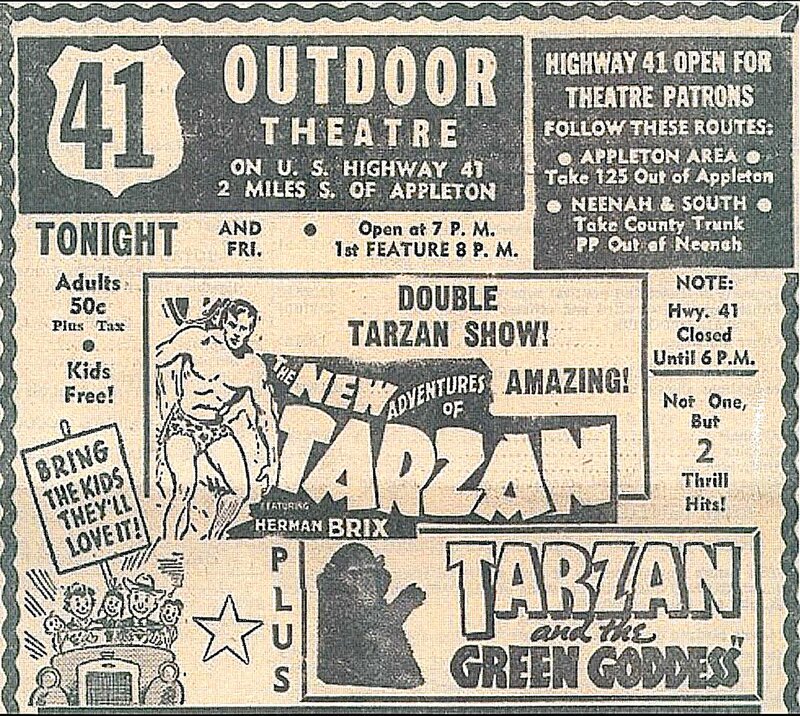 He casually becomes a part of a group including ALICE MARTLING, Martling's daughter, GORDON HAMILTON, her fiance, and GEORGE, an admirer of the Ape-Man, who has stowed aboard with Nkima, Tarzan's pet chimpanzee. ULA VALE, a mysterious woman, and RAGLAN, a racally explorer, trailing Martling to get posession of the document, dircting the expedition to the Goddess, are also passengers. 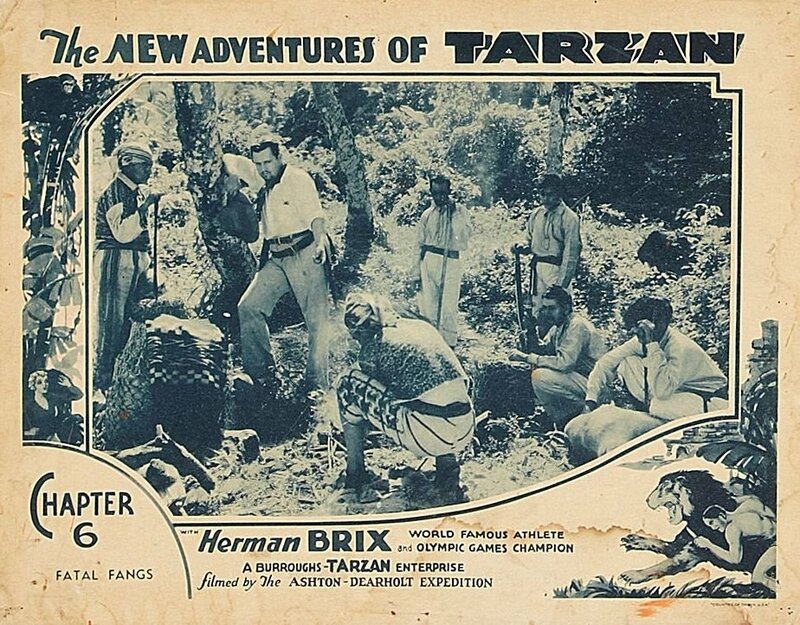 Learning that Martling has mailed the document to someone in Guatemala, the adventurers attack him in order to learn its whereabouts, but flee empty-handed when Tarzan comes to the rescue. 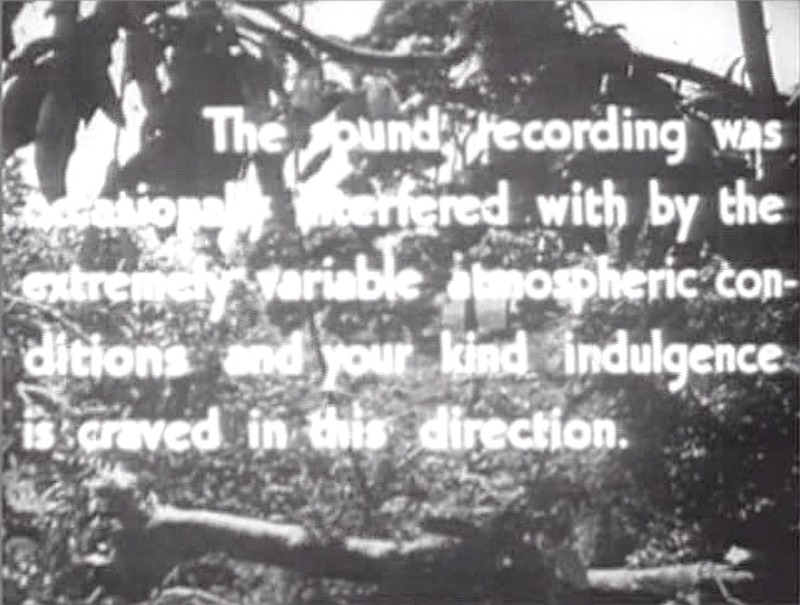 In Guatemala City, while Martling and Tarzan prepare for their expedition, Raglan gains possession of the document, escapes with it and starts for the jungle. They pursue him. However, Raglan, arriving at the point designated in the document, unearths the entrance to the secret underground passage leading to the lost City and the Green Goddess. 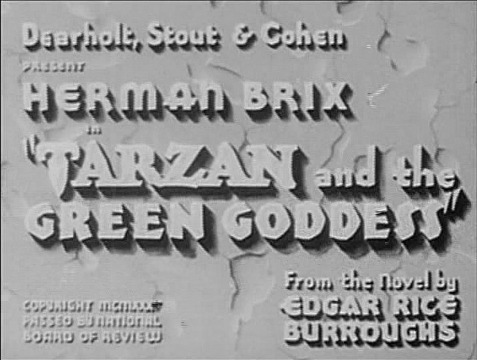 Tarzan's party arrive and enter the Lost City, only to be seized by monster servers of QUEEN MAYA, in whose court they find D'Arnot a prisoner and behold the GREEN GODDESS. Maya declares all must die save Tarzan, who may remain as her consort. Tarzan, refusing, is strapped to the altar and Maya plunges her dagger toward his heart. In the heart of Africa, explorer Major Martling prepares an expedition to Guatemala to hunt for the Green Goddess, the totem of the inhabitants of a lost Mayan city which contains a fortune in gems plus the formula for a super-explosive. Bouchard, a frantic stranger, persuades Martling to help him find Tarzan, who Martling knows. 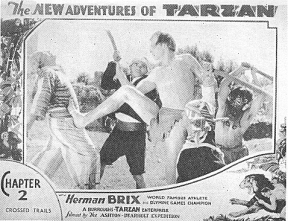 Guided by Martling's bumbling valet, George, Bouchard nears Tarzan's home in the African jungle, but is mauled by a lion. Before dying he is able to tell Tarzan that d'Arnot, Tarzan's best friend, has crashed his plane in the wilds of Guatemala and may have been taken captive by the natives of the same Lost City which Martling seeks. but has no proof. Raglan, having briefly seen the telegram, however, knows now that the codebook is in the possession of Padre Mueller in Chichicastenango, Guatemala. Reaching Chichicastenango, Raglan races to Padre Mueller's house and convinces his servant that he is Major Martling. When Tarzan, Martling and the others reach Mueller's house, the codebook is gone. The servant's description of the thief matches Raglan, and the Tarzan-Martling party set off in pursuit, followed, in the background, by Ula Vale. Tarzan and N'Kima leave the Martling party to travel by canoe, and sets off by the trees, trying to head off Raglan. But Ula Vale has caught up with him first, and has him at gunpoint when he trips her up and throws her into a raging river. Tarzan hears her screams and rescues her, learning then that she is seeking the goddess because her fiance, who died in the crash of d'Arnot's plane, was an archeologist seeking to preserve the goddess from adventurers. Tarzan leaves Ula with her bearers and proceeds on after Raglan. Meanwhile at a riverside native village, Raglan steals a kayuka and kills a native, and the Martling party, on landing there, are seized as accomplices. 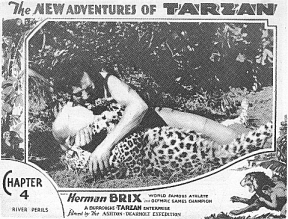 Tarzan must rescue Alice from a panther in a torture-pit into which she has fallen, then drive off the natives and free Martling, George and Gordon. The Tarzan-Martling party arrives at the Lost City, but are captured by its native inhabitants and are taken to an underground temple. There, they find d'Arnot also a prisoner, behold the green goddess, and meet the statuesque white woman, Queen Maya, who rules over the city. 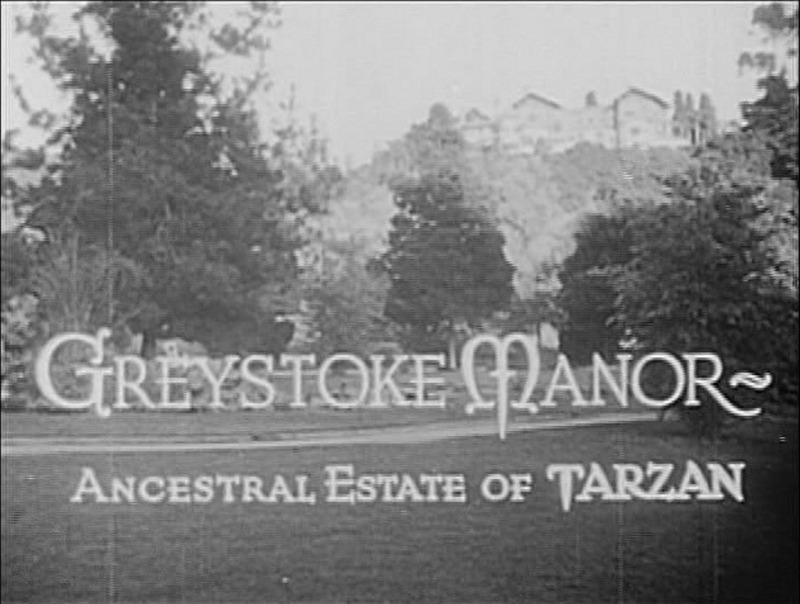 Maya declares that the Martling group must die, but Tarzan may be spared if he will become her consort. 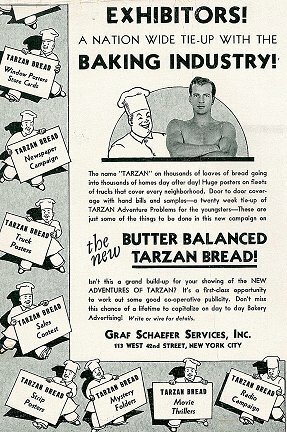 Tarzan refuses and is strapped to the altar. Maya plunges a dagger towards his heart. Unable to overcome her infatuation for Tarzan, Queen Maya, drops the dagger. The monsters rush toward her, infuriated, but are diverted by the discovery of Raglan dragging the Goddess through an opening in the roof. Confusion reigns. 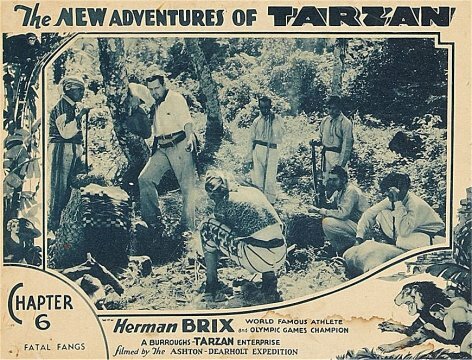 Tarzan, the Martling Party and D'Arnot battle their way out into the Lost City, where George rescues them with a machine gun he has concealed in a mysterious black case. However, Raglan escapes through the underground passage, dropping the document as he flees. Martling, espying the document, gives it to Tarzan for safe-keeping. Meanwhile, government officials, Ubico and Alvarez, learning that a ship carrying a contraband cargo of ammunition and firearms is bound for the Guatemalan Coast, commission Operator 17 to run down the smugglers. Outside the passage, Raglan discovers his loss and knowing the Goddess is useless to him without the document, caches the Goddess and starts back, unaware that Ula Vale is watching him. Martling and his party start through the passage, hoping to overtake Raglan, but as George trips over a string a terrific explosion occurs. Madly in love with Tarzan, Queen Maya stays her hand. Suddenly, the natives notice Raglan lowering a noose through the temple's chimney-hole from above, snagging the Green Goddess and hauling it away. D'Arnot frees Tarzan from the altar, and the apeman rescues the Martling party, who were about to be thrown into a pit of alligators. In the ensuing confusion, they escape aboveground, where George rescues them with a machine gun he's been carrying concealed in a black case. Raglan escapes with the Goddess, but drops the codebook, unawares. George finds it and gives it to Martling for safekeeping. Ula, en route to the Lost City with her bearers, spots the fleeing Raglan and starts to follow, but is attacked by a panther. 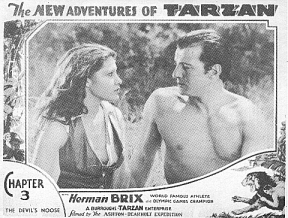 Tarzan rescues her, introduces her to Martling, explains their respective missions to each other, and gets them to agree to join forces. Without Ula, the others pursue Raglan, who has preceded them through an underground passage and set a dynamite trap. Unawares, the others follow into the passage, stumble over the trip-wire, and there is a terrific explosion. Plunged into darkness and half-buried in rocks and dirt the Martling Party realize that Raglan has laid this trap for them. 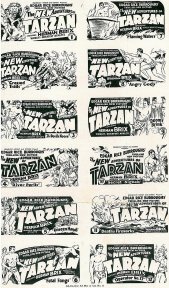 Tarzan is missing, evidently having fallen through a large hole in the floor of the cave, from which can be heard the rush of a subterranean river. Raglan hears the explosion and, with the aid of his two henchmen, digs his way to the party. Abashed to find the Goddess, telling them of his innocence and Martling invites him to join the search for the Goddess, telling him however, that the document has disappeared with Tarzan. Ula and her aides -- Garcia and Lopez, with the Goddess in their possession, approach the river's edge. Ula, arrested by Tarzan's unconscious form floating on the water, rescues him from a crocodile and is trying to revive him, when she sees Raglan approaching. She escapes with the Goddess, leaving Tarzan still unconscious. Raglan is about to search Tarzan for the document, when the Martling Party arrive and Tarzan regains consciousness. Nkima, the ape, tells Tarzan that he has been rescued by a woman who has fled with the Goddess. After placing D'Arnot, Alice and Gordon on a mail boat bound for Puerto Barrios, Tarzan and the others start on Ula's trail. In the lead, Tarzan leaps into a native noose trap, set by Garcia, and with terrific force is whipped high into the air feet first. Unharmed, the Martling party find themselves trapped in the now-sealed passageway, and discover Tarzan has apparently fallen through a hole in the tunnel floor into a watery pit filled with alligators. 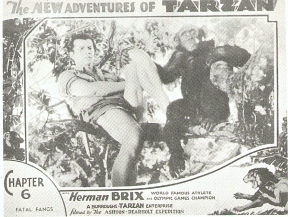 Tarzan miraculously eludes the reptiles and surfaces in a nearby river, where he meets Ula and N'Kima on shore. N'Kima informs Tarzan he has heard the others calling for help from the sealed tunnel, and Tarzan, Ula and her men dig them out. Meanwhile, Raglan discvers he's lost the notebook, caches the Goddess in a handy jungle shack, and backtracks himself to find it. He finds Tarzan, d'Arnot, the Martling party, and Ula and her men encamped for the night, and sees Martling with the codebook. When Martling goes for an evening stroll, Raglan jumps him and regains the book. Ula finds the recovering Martling and goes after Raglan. When she reaches the shack, Raglan knocks her out, sets fire to the shack and leaves with the Goddess. 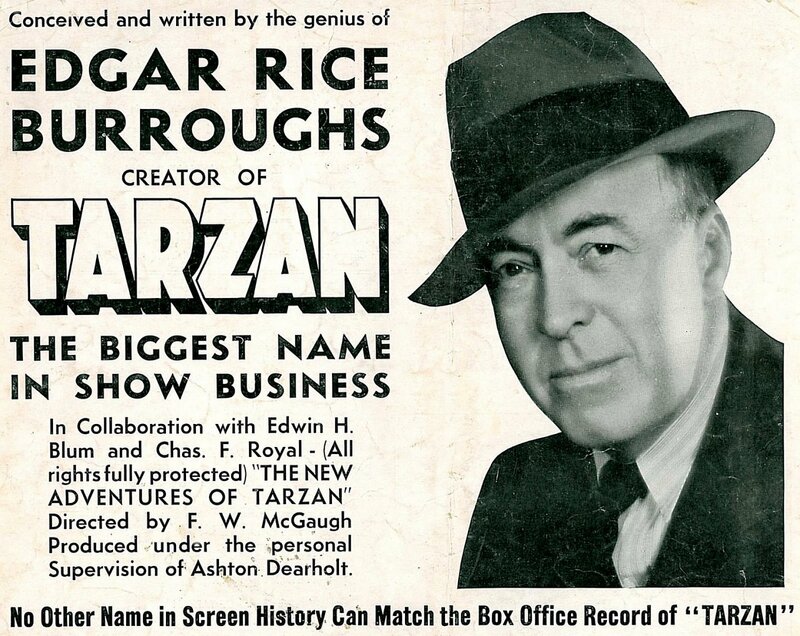 Tarzan, having also found Martling and learned what happened, is now on the trail and comes upon the burning shack. Hurrying to rescue Ula, he accidentally steps in a native animal trap and is whipped into the air by a noose, feet first! 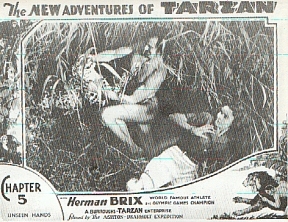 As Garcia lowers the apparently unconscious Ape-Man to the ground, Tarzan throttles him. Raglan, watching from the trail, decides to aid Garcia, and thus recover the document, but Tarzan drops Garcia to the ground, unconscious, freeing himself from the trap. Garcia, refusing to betray Ula, warns her of danger with a signal. After making camp, Raglan orders his two men to guard Garcia, while he joins the others in searching the river banks for a trace of Ula's kayuka. Martling and George take one kayuka -- Tarzan another. However Raglan returns to camp, where unable to bribe Garcia with money, he leaves a knife in reach of the man and hides in ambush, with his cohorts, awaiting Garcia's departure so that he can follow him to the Goddess. Meanwhile, in Puerto Barrios -- D'Arnot having disembarked for France -- Gordon attempts to send a telegram in code for Major Martling. This arouses the suspicions of the Secret Service and Gordon and Alice are sent to Guatemala City under guard. George and Martling venture up a lagoon. Leaving their boat, to search for tracks, they become bogged in quicksand and start sinking rapidly, immediately by alligators. Tarzan grabs his knife, cuts himself loose, races into the shack, and rescues Ula. Joined by the others, he leaves her in their care and sets off after Raglan. Raglan sends his men, Paco and Nahua, to Livingston with a message for Hiram Powers, then continues through the jungles with the Goddess, heading for Puerto Barrios. He comes to a jungle lumber-mill and is able to gain passage on the company's departing sternwheeler before Tarzan can overtake him. 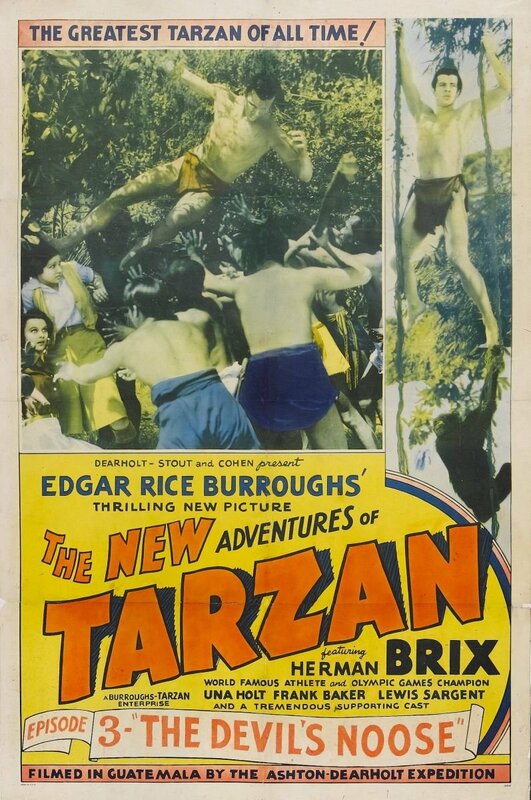 Tarzan returns to Ula and the Martling party, and they hail another passing riverboat to Puerto Barrios, where d'Arnot, weakened by his long ordeal in the Lost City, is to be sent back to England in the care of Alice and Gordon. This accomplished, Tarzan, Martling, George and Ula begin searching Puerto Barrios for signs of Raglan. He is at a local hotel, conferring with two white henchman in an upstairs room. They have been wired by Hiram Powers to take the Goddess to the deserted jungle city of Quirigua. Tarzan spots Raglan on the hotel balcony and confronts him in the room, but the two thugs help Raglan push Tarzan off the balcony! Tarzan, hearing George's frantic screams, rapidly makes his way to the lagoon. Leaping onto a liana, he reaches down and pulls the two to safely. Back at the camp, Garcia dashes up a trail. Nkima, seeing this, shrieks loudly. 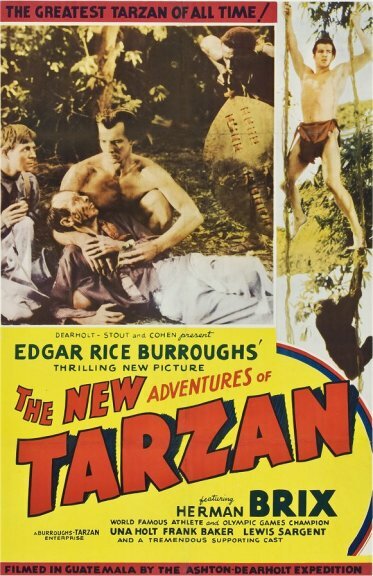 Raglan sends his two men -- Paco and Nahua -- to follow Garcia and returns to camp, determined to annihilate the ape before Tarzan learns of Garcia's escape. While his shot at Nkima goes astray, Tarzan, Martling and George, hearing it rush back to camp. Raglan attributes the shot to Garcia's escape, telling them that his men will pick up the trail. Garcia reaches Ula's hide-out and, while Paco returns to inform Raglan, Nahua falls into a trap and is taken captive. As night falls, Martling, Tarzan, George and Raglan take shelter with an Indian family. Paco, joining them, tells them that he failed to find the trail and has lost Nahua. Drawing Raglan aside, Paco enlightens him and the two make their way to a huge boulder overshadowing the hut in which the party is sleeping. From the opposite direction, Ula and her men are heading for the boulder. Hearing the sound of machetes, Tarzan starts up the hill to investigate, but unseen hands release the boulder -- sending it crashing downward -- directly toward the house. 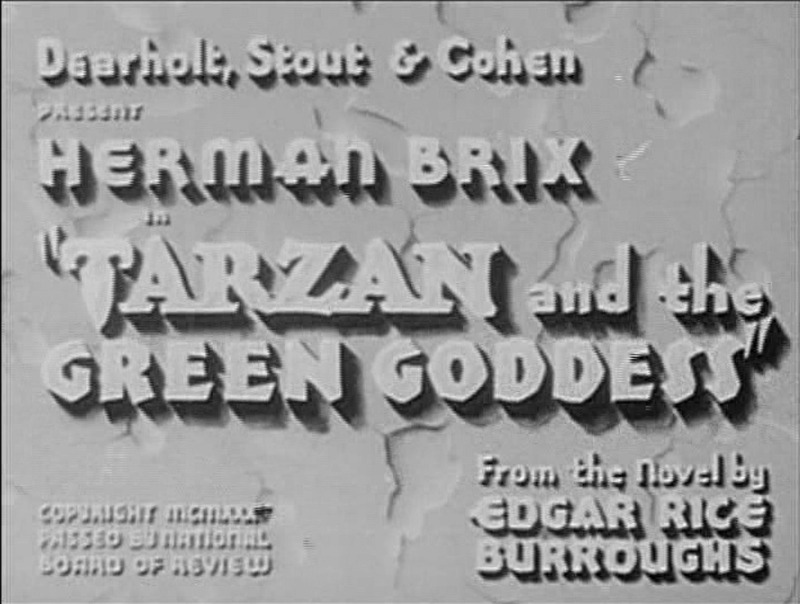 Tarzan is knocked out by the fall, allowing Raglan and his men to escape again with the Goddess. Martling and George find the reviving Tarzan and learn he has recovered the codebook during the fight. In the hotel room, they also find the wire from Powers and set out for Quirigua, along with Ula who knows the way there. In the jungles, Tarzan leaves his three comrades on the trail and sets off through the trees. Raglan leaves his men in an encampment and proceeds alone to Quirigua to hide the Goddess. 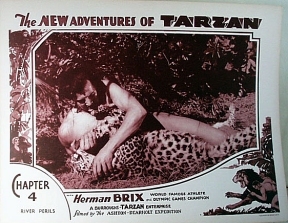 Tarzan's pursuit is delayed when he stops to help and injured deer and is subsequently attacked by a lioness, which he defeats. Martling, George and Ula reach Quirigua, where Raglan has hidden the goddess and is able to slip away undetected while they tour the ruins. Tarzan finds the encampment of Raglan's men, and there is a furious battle. 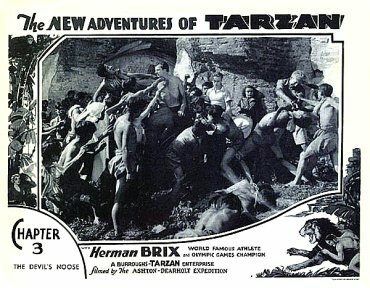 Several bearers restrain Tarzan while one of their number plunges a machete straight at Tarzan's heart! Tarzan picks up a smaller boulder, throwing it directly in the path of the oncoming boulder, which veers slightly and crashes into a corner of the house, destroying their food. In the morning, Raglan volunteers to hunt for game. He and Paco, surreptitiously hasten to Ula's hide-out where they find Nahua alone. As they are unfettering Nahua, Ula arrives. Raglan tries to bargain with her for possession of the Goddess. She states she will talk business when the document is produced. Meanwhile, Alice and Gordon reach Guatemala City where, they are notified that they will be detained until a satisfactory translation of the code message is obtained. Gordon is placed in jail, while Alice is allowed her freedom on condition that she remain in the city. 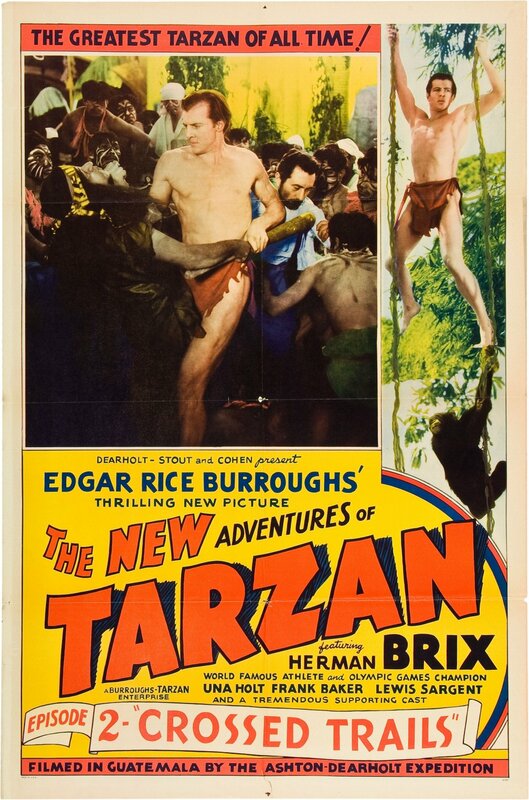 Annoyed at Raglan's lengthy absence, Tarzan goes in search of game. He is returning with his catch, when Raglan and his men sight him. Raglan draws his gun, just as a huge tiger leaps from the brush toward Tarzan, who jumps aside only to land in a brutal tiger trap, the spikes of which close about him. Tarzan knocks out his attacker with a well-placed kick, but the other natives overpower him. The two white henchman decide he should be kept alive in case Raglan wants to question him about the codebook. They have the apeman bound to a tree, then send the bearers to Quirigua while they wait in a shady glade. With the thugs out of sight, Tarzan expands his chest muscles and biceps and bursts his bonds, then thrashes the two thugs and runs them off, then proceeds to Quirigua. Meanwhile, Martling, George and Ula encounter a native who requests their help with a sick white man. Martling goes and finds it is Raglan, delirious with a sudden jungle fever. Waiting for Martling's return, George becomes restless and goes for a walk alone in the jungle. He becomes hopelessly entangled in a web of vines. 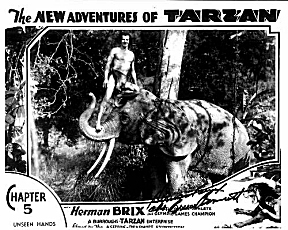 Tarzan, hearing his cries for help, hastens to the rescue but springs a panther trap set by natives. A springboard armed with wooden spikes crushes him to the ground!